Regattas often bring with them diverse wind conditions, forcing an even more diverse sail program. Crews need to be prepared to handle whatever Mother Nature decides to deal out. Sending it - Douglas Curtiss' J/111 Wicked 2.0 sails for a win at the PHRF New England Championship at the 2018 Buzzard's Bay Regatta. Photo by Alex Clegg. Researching the most up-to-date forecasts, in combination with understanding the venue, is absolutely critical in preparing for success on race day. Local knowledge can be a key weapon to have in your strategic arsenal of tricks when dealing with current and knowing where and when to hide on the course. This knowledge proved valuable this year, as Gary said forecasts for spot on. Shifting from heavy, building breeze one day then down to light air the next can take a toll on even the best crews. Staying connected, both inside and outside the boat, is essential. So is understanding the limits of technology, according to Gary. As much as it helps, it can also hinder boat awareness. Keep the helmsman and crew engaged with what is actually going on. Remember the basics. Be aware of what the tell tales are communicating and how the boat feels as conditions shift. Communicating weight management and sail trim relative to tactics and strategy in varying conditions will help keep the team focused on the impact their individual roles have in the outcome of the race. Gary reminds crew to keep fun in the program. Make sure everyone, including the owner, is enjoying the day. Remember to keep the dynamics positive and enjoy the race, regardless of what Mother Nature has to say about it! Understanding how crew weight plays into the sail plan for the event is another consideration when preparing the boat. Dialing the rig and managing the tune as conditions build or diminish will have a direct result on how the boat responds in varying conditions. Consider the differences between symmetrical and asymmetrical car set-ups to take advantage of favored tacks in chop. The crew on Wicked 2.0 fell about 100 pounds underweight for the one design class weight of 1,430 pounds. This led the crew to carry the J3.5 and J4, when normally the J3 would have been selected had the crew weight been heavier. The A2.5 (Airx 700) spinnaker proved to be the optimal kite in the heavier conditions, seeing a top speed of 14.5 knots on the J/111 for Saturday. Sunday’s light winds called for the J1 and A2 kite, then dialing the rig back down to base. Whether races see big breeze or light air, it’s important to know and communicate when it’s time to change gears along with changing conditions. Develop a strategy (or two! ), be aware of what is happening both on the course and in the boat, then adjust as needed. 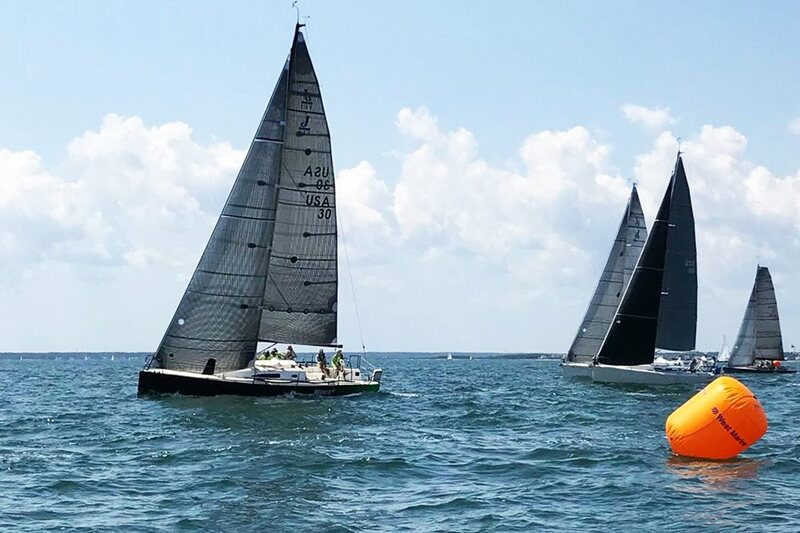 Click here to view the full results of the 2018 Buzzards Bay Regatta or feel free to reach out to Gary with any questions!